This incredible solitaire ring is unique in every way, from the distinct color and cut of the stone, to the beautiful treatment of the solid gold band. 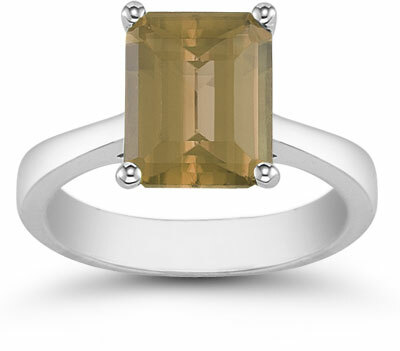 The Emerald-Cut Smoky Quartz Solitaire Ring in 14K White Gold is unlike the standard jewelry pieces of today. This ring makes a statement about individuality and refined taste. The ring features an exceptional smoky quartz stone (6mm by 8mm) that conjures up an image of fine bourbon poured into a lead crystal glass. The rectangular cut of the stone is a throwback to a tradition of the last century, and allows for the light to enter through the long facets where it simmers inside to produce a richer, deeper color. A solid gold setting holds the smoky quartz in place and positions it on a 14k white gold band (4mm) with a subtle satin finish. This smoky quartz solitaire is not your typical ring. It has a strong, bold nature, just like the unique properties of the stone, and lends itself well to those with a sophisticated taste. We guarantee our 8mm x 6mm Emerald Cut Smoky Quartz Solitaire Ring, 14K White Gold to be high quality, authentic jewelry, as described above.